Go deeper into the Halo universe than ever before with Halo Legends, an all-new, CG and traditional anime PG-13 experience that presents enthralling new stories from one of the world’s most popular video game franchises. Produced by 343 Industries, a part of Microsoft Game Studios, the exciting tales-beyond-the-games will be distributed February 9, 2010 by Warner Home Video as a Special Edition 2-disc version on DVD and Blu-Ray™ for $29.98 (SRP) and $34.99 (SRP), respectively, as well as single disc DVD for $19.98 (SRP) due date for all versions is January 5, 2010. The chapters will also be available On Demand and Digital Download. Halo Legends is a seven-story anthology – told across eight spectacular episodes – that explores the origin and historical events of the Halo universe and its intriguing characters. Halo Legends has been created in the same breakthrough format as The Animatrix and Batman Gotham Knight with each individual episode imagined by a cutting-edge, renowned Japanese anime director/animator, including Shinji Aramaki, Mamoru Oshii, Hideki Futamura, Tomoki Kyoda and Yasushi Muraki. The stories are inspired and produced by the creative minds of 343 Industries, including Halo franchise development director Frank O’Connor and managing editor Kevin Grace. The episodes are animated by some of the world’s most respected studios and directors in anime today. The studios range from Production I.G. (Ghost in the Shell, Batman Gotham Knight), Bones (Cowboy Bebop, Fell Metal Alchemist) and Toei Animation (Dragonball Z, Digimon) to Studio 4oC (The Animatrix, Batman Gotham Knight) and Casio Entertainment. 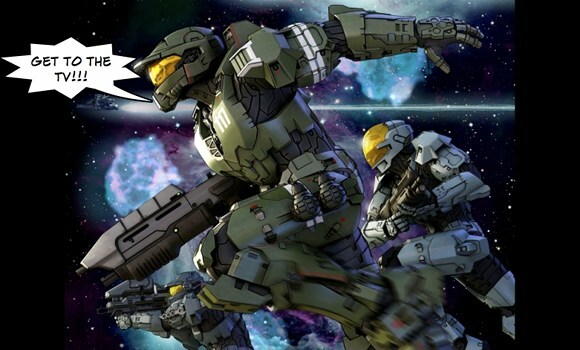 The stellar roster of animation talent on Halo Legends is highlighted by creative supervisors Shinji Aramaki (Appleseed) and Mamoru Oshii (Ghost in the Shell); directors Shinji Aramaki (Appleseed), Hideki Futamura (The Animatrix), Daisuke Nishio (Dragonball Z), Hiroshi Yamazaki (Karas), Toshiyuki Kanno (Black Lagoon), Koichi Mashimo (Blade of the Immortal) and Koji Sawai (Patlabor); directors/action designers Tomoki Kyoda (Eureka Seven, Evangelion 1.0) and Yasushi Muraki (Macross Plus, Vampire Hunter D); and writer Dai Sato (Cowboy Bebop). Halo: Gaming Evolved – Explaining the Halo phenomenon from its inception as an Xbox video game to a present day entertainment franchise. Runtimes: Disc 1 – Estimated 119 min.